Click an obituary for more details and to send condolences. Wishes:In David’s memory a donation may be made to the Miramichi SPCA or the Shriners Hospital. 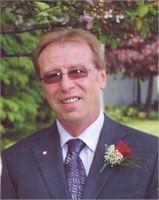 The death of David Brodie MacCallum, husband of Rose (Taylor) MacCallum of Miramichi, NB, occurred at his residence on Wednesday, January 30, 2019 at the age of 66. Born in Newcastle,NB, David was the son of the late Robert and Charlotte (Stimson) MacCallum. David was a former employee of Repap as a paper machine back tender. Besides his wife Rose, David is survived by his daughter Terri McNeill (David) of Fredericton, NB, his brother Gregory (Theresa) of Oromocto, NB and his two grandsons: Logan and Cole, stepson Mark Steeves of Douglastown, NB, one niece and one nephew. Visitation will be held at Bell’s Funeral Home, 651 King George Highway, Miramichi, NB, on Tuesday from 2-4 & 7-9 PM. Funeral Service will be held from The Sterling Bell Memorial Chapel, 651 King George Highway, Miramichi, NB, on Wednesday, February 6, 2019 at 1 PM with Pastor Kevin Matthews officiating. Burial will take place in the Saint Samuel’s Roman Catholic Church Cemetery, later in the spring. In David’s memory a donation may be made to the Miramichi SPCA or the Shriners Hospital. A tradition of service to the families of the Miramichi and surrounding communities since 1922.